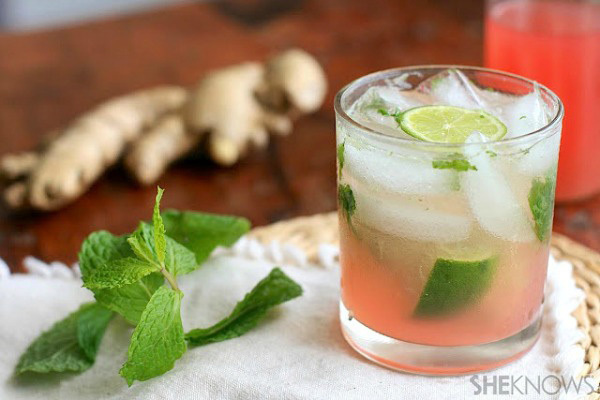 Incorporate seasonal rhubarb into your next happy hour with this refreshing rhubarb and ginger mojito. Adjust the rhubarb and ginger syrup in this cocktail to give it as much zing as you like. It’s a perfect combination with fresh mint. In a glass, muddle together the mint and lime wedges. Add the rhubarb and ginger syrup and rum. Stir to mix. Fill glass with ice and top with a splash of sparkling water. Garnish with a slice of lime and mint leaves, if desired. In a large saucepan, combine the rhubarb, ginger, sugar and water in and bring to a boil. Reduce heat and simmer, uncovered, until the rhubarb is soft. Remove from heat and let sit for 30 minutes. Pour mixture through a fine-mesh sieve into a bottle. Chill syrup completely.